If you are somewhat familiar with the remanufacturing process, you may have gotten the impression that empty cartridges are simply refilled and then sealed. While there are some disreputable manufacturers who do only this, most reputable manufacturers take far more steps in the procedure. First, the cartridge is completely emptied so no toner particles remain. Once cleaned out, the cartridge is disassembled and inspected for any components that might be worn out or broken. If any are found, they are replaced with fresh parts. The cartridge is then reassembled and new toner is poured into it until a certain weight has been reached. At that point, the finished product is tested for quality before being sealed and packaged. Remanufactured toner cartridges are an affordable alternative to the often inflated prices offered by the original manufacturer of the printer. Because of this, some major manufacturers may try to convince you that using third party cartridges will void the warranty on your printer, which is not true at all. In fact, remanufactured cartridges are designed to meet or exceed the specifications of their OEM counterparts, and reputable sellers provide a satisfaction guaranteed, reducing any risk to the buyer. 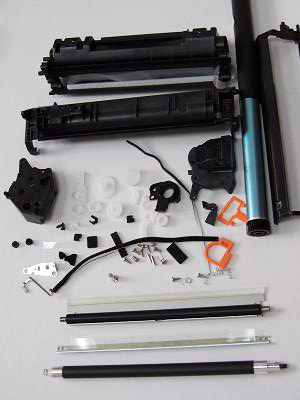 One of the best benefits of remanufactured toner cartridges is that they are made from recycled cartridges. In this way, they keep cartridges from ending up in a landfill and harming the environment. Many companies that sell remanufactured cartridges also offer a cartridge recycling program. This is just a way to make the process of recycling your empty cartridges simple and free by providing you with a prepaid return tag. Keep in mind, though, there are often a minimum number of cartridges that must be returned in order to use the program. For buyers who wish to save money on printing, remanufactured cartridges can be an excellent alternative to the high price tag of OEM versions. Using remanufactured toner is a more economical way to print and an environmentally-friendly solution to unnecessary waste.